Origin: Brazil & other northern regions in South America in rivers and pools. 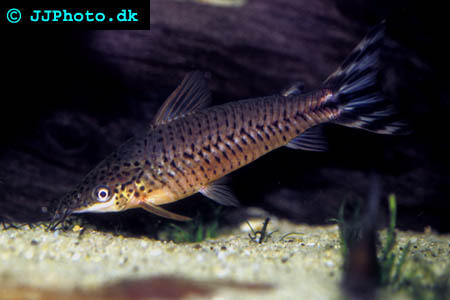 Company: Dianema urostriatum (Flagtailed Catfish) are suitable for community aquariums. Aquarium setup: Dianema urostriatum (Flagtailed Catfish) Prefers an aquarium with a lot of rocks and roots arranged in such a way that a lot of hiding places are created. There should be dense vegetation on the aquarium sides.. They particularly like broad leafed plants. Dianema urostriatum (Flagtailed Catfish) is best kept in groups. Feeding: Dianema urostriatum (Flagtailed Catfish) accepts all food they can find on the aquarium bottom. 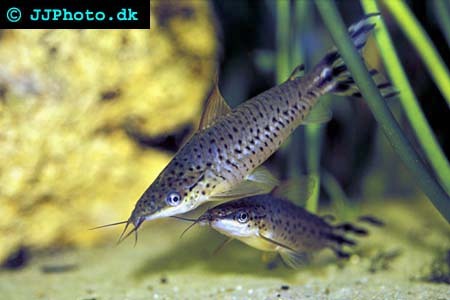 Breeding: Dianema urostriatum (Flagtailed Catfish) can be breed in aquariums. Large water changes and a lowered temperature may help trigger spawning.